The instant pop art creation program for anybody with a right-brain. Talent optional. FREE! FREE! FREE! The image shown was created by applying a preset compositionto a stock photo image. Pimp out your myspace profile in record time. NEW: Studio Version with high-resolution and PDF Output. 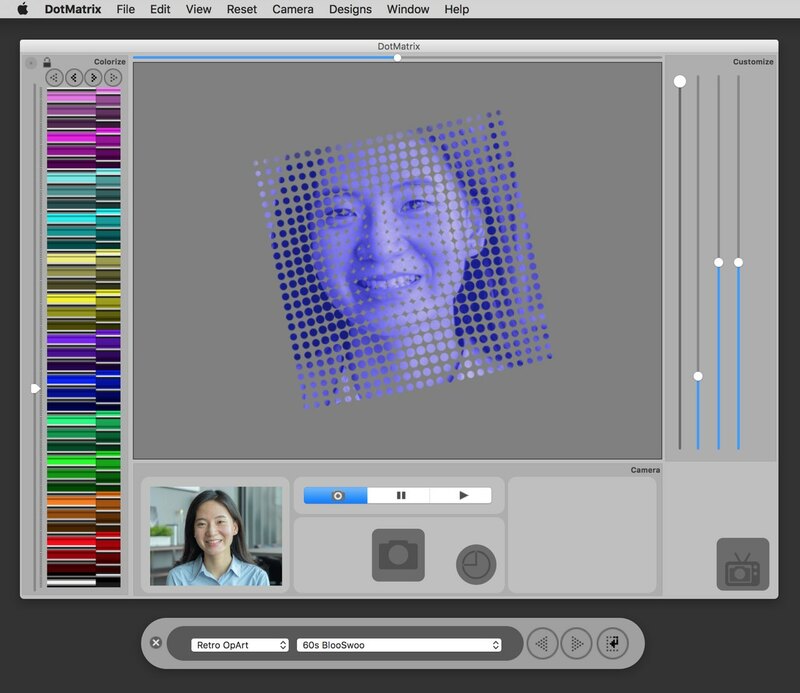 YOU CAN EASILY MAKE Pop|Op art LIVE with your Mac's camera (iSight) or from digital photos. Just pose and click. Select from hundreds of compositions easily customized to your favorite color. Your own instant art factory! With a paid license, access hi-res iSight 2G or send DotMatrix video/webcam effects directly into Youtube, Facebook, Skype, Y!Messenger, Flash, Stickam, Qamera, and MORE! With a Studio license, create giant art posters (samples) from low-resolution celphone and digital camera photos. Or from pictures you grab from iSight or internet. DotMatrix ushers in a new era of instant retro/pop/art photography, combining powerful, non-destructive, Photoshop-like eye-candy, shareable codes and live iSight preview (works with most cams). Now, ANYONE and do we mean ANYONE can make sophisticated pictures using just a Mac and the built-in camera. You don't have to be artistic if you can click and POSE! Over 400 instant, ready to use photo/art compositions (presets). Click here for the most important menu command in DotMatrix!!! DotMatrix is very easy to use. 1. 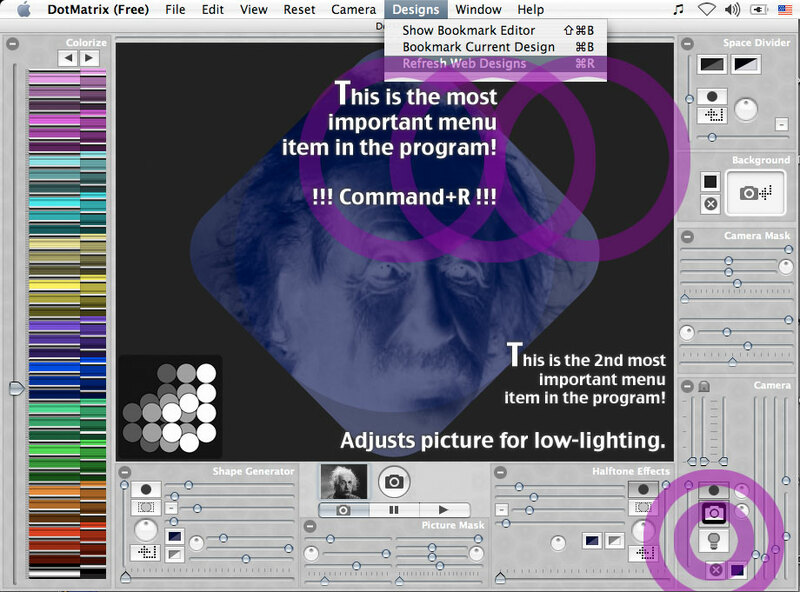 Plug-in your camera (if not built in) and start DotMatrix or drag an existing picture to the DotMatrix dock icon. 2. From the Design menu, choose Refresh Web Designs to get the latest designs from the internet. The update runs in the background so you can keep working. 3. From the Design menu, choose a design from a category Manga/Comic, Retro/Popart, Futuro/SciFi or Basic. 4. 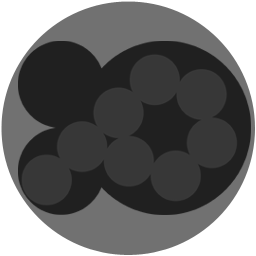 Adjust the contrast, black level and brightness controls to taste. 5. Personalize the color with a single click on the left-hand color stripe! Use the arrow buttons to step through schemes one at a time. 6. Click the Grab button to instantly snap a JPEG picture to your Pictures folder. 7. Bookmark your favorite designs, customize them and email them to friends who can apply them to their own photos. DotMatrix FREE 1.703 was released on 2012/07/02. You can find the latest free download here. 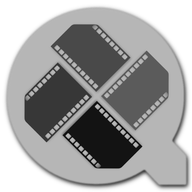 DotMatrix & Studio 1.703 was released on 2012/06/28. Registered users go to password protected download area. Ms.Black visual tutorials are here..
Ms.Black shows us how to make any preset Design "look right". Ms.Black demonstrates how to post a Flickr image along with the bookmark codes used to create the image. Before posting your question, check to see if it has already been answered. Post your question in the group discussions (forums). If using DotMatrix, you can put the codes in the comment text of a photo upload. Submit your design codes for inclusion in the list of User Designs. All designs are tested and moderated. If you would like to become a regular moderator/contributor, please write us (you must know how to use blogger, some limited HTML knowledge required) and be sure to post at least 30 images (with codes) to our flickr.com photo pool. We are currently shipping the Standard Version of DotMatrix. DotMatrix Studio Edition is now available. All customers that pre-order the studio version receive a complimentary license for the Standard Edition at no charge. Purchase a serial number now in our secure online store.